Updated with video and email attached at the end. For the most part, protests on college campuses involve just college students. It must take a very special person to trigger an entire faculty department to plan an organized walk out. Charles Murray, who first articulated the concept of the bell curve, spoke at Princeton University today. Murray was invited to speak as part of the Future of Capitalism speaker series, and his speech was entitled ‘This Time Really Is Different’: Coming to Grips With the Coming Job Crisis. However, they were far from alone. An English class apparently ended early so students could attend the protest as well. 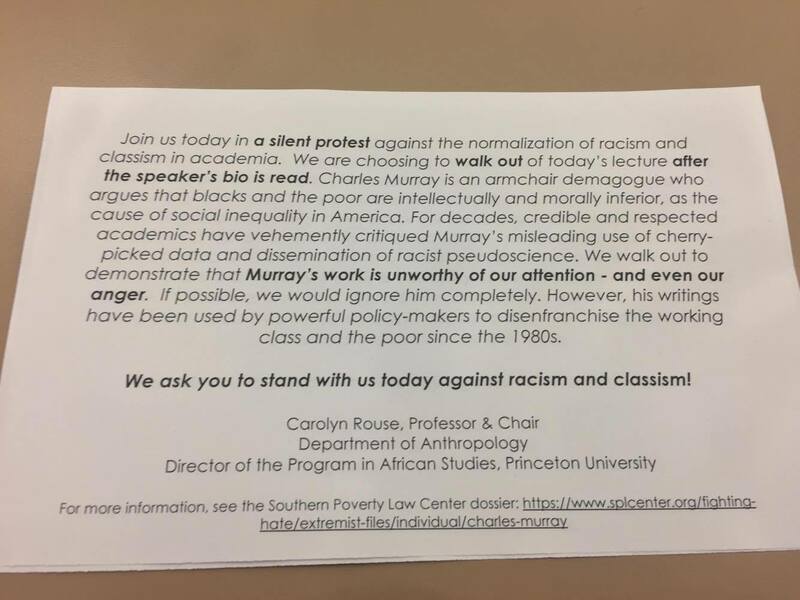 Anthropology professors were handing out the following flyer urging the walkout. After Murray’s biography was read, the faculty left the room. When faculty protesters begin to resemble student protesters, there is probably a much deeper problem. It remains to be seen what action, if any, Princeton will take in response to this. In the meantime, the lesson in the short term seems to be be careful what you wish for if you are a conservative speaker on a college campus. The faculty might now join the students in protesting. Speaking at Aaron Burr Hall at Princeton in an hour (4:30). Y'all come. Free added attraction: Protesters. I'd feel neglected without them. This is an email, sent to me in part of a longer email chain, that seems to have been authored by Carolyn Rouse, the professor leading the walkout. Is it intellectually honest to encourage the protest of that which many have not read? How would one know that Mr. Murray ‘s work was racist without knowing the content?